FoxGate S9824-GS12M2 – high performance OSI, 3 level switch of new generation, supports IPv6, certified by IPv6 Phase ll, complies with CE and ROHS standards. FoxGate 9816-GS8X2 – backbone high performance reliable switch, specially designed for distributed and local Ethernet-networks data centers and server rooms. 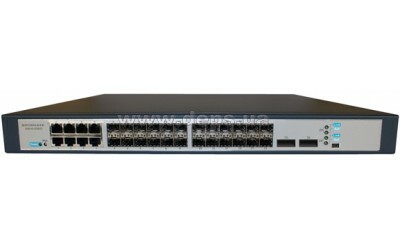 Switch FoxGate 9816-GS8X2 has 24 slots for SFP-tranceivers installation, 8 are commbinated with RJ-45 port and 2 XFP-slots. Additionally the switch front panel has mini-USB connector for secure out of band management. Promotion of IP-traffic at full interface speed, high performance and reliability allow us to recommend this switch to use at kernel-level and in corporate backbones or carrier networks in all cases where it is required to ensure high network performance, quality performance critical applications and high level of data protection. Dynamic IPv4 (RIP v1/v2, OSPF v2, BGP4, IS-IS) and IPv6 (OSPF v3, BGP4 +) as well as static routing at full speed of Gigabit Ethernet interfaces and non-blocking advancement of IP-traffic for building of a modern high-performance multi-service network with a high level of subscriber’s data and traffic protection. High reliability, provided by redundancy of backbones (STP, RSTP), routers (VRRP, HSRP) and by the trunks organization for fast network performance recovery after accidents on backbones..
Protocols support: DVMRP, PIM-DM/SM and IGMP for optimal transmission of different types of multicast traffic in multiservice networks. Developed means of ensuring network security and network protection - from the MAC-address filtering and VLAN up to set access control lists (ACL) on the levels of L2/L3/L4. Flexible means to ensure the secure management and diagnostics: SNMP, Web-interface, Telnet, SSH, and mini USB to LAN-management, the use of a set of commands similar to the equipment used by Cisco, and the ability to mirror traffic from any port.